First things first: Tiggly Shapes are not robots. But they are still pretty great. I’ve discovered they are a great way to bring dimension to the flat tablet world. They also can be used in libraries pretty easily. What are they? Tiggly Shapes are a set of four shapes designed to work with the iPad and certain apps. What’s in the Box? Tiggly Shapes. How Did We Acquire it? My library purchased for patron and program use. 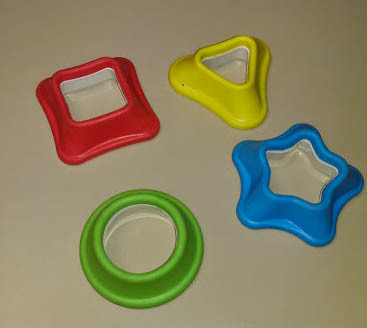 We bought Tiggly Shapes to use with the iPads we let patrons sign out while they are in the library. When we came across Tiggly Shapes we thought they would be a great addition to our iPads. Our space encourages lots of play, so having the shapes go with the iPads was a nice complement to our early literacy efforts. Patrons simply ask for the bag of Tiggly Shapes when they sign out an iPads. We have loaded the three apps that work with Tiggly to each iPad so the patrons can easily choose which app they like best. There are three apps to use with Tiggly Shapes: Tiggly Stamp, Tiggly Draw, and Tiggly Safari. They each work a little bit different, but have similar play styles. Tiggly Stamp uses the shape to make different pictures set against various backdrops. Tiggly Draw lets you use the shapes on the iPad to create pictures of whatever you’d like. Tiggly Safari is a little more interactive. It asks for certain shapes to be placed on the iPad, and makes different animals. Tiggly Safari is by far the most popular app kids use! Tiggly can also easily be used in Storytimes. I’ve used it with toddlers (age 2-3). Tiggly is a great compliment for when you are exploring shape themes. 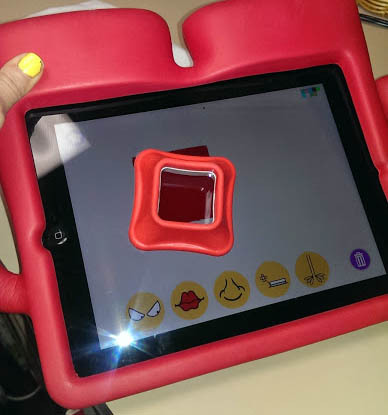 The apps are easy to use, and you can let the kids use the Tiggly Shapes on the iPads. It is a great way to incorporate some interactive technology with the younger set. You have to be able to put apps on iPads, and that is it. I love Tiggly! Our patrons really love using them. Once they see how they work, kids like using them with the iPads. I like how they allow for more motor skill development. I do wish there were some classroom sets for Tiggly. While I love what they do, I can’t help but wish they had a few more options for educators. Great fun for the younger set! Next Next post: Take it Apart!